If your conductivity controller is more than 5 years old, it may be losing efficiency. Upgrade and save up to 40% on water costs. 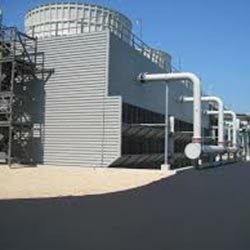 Annual water savings with a new Cooling Tower Conductivity Controller can be as much as 800,000 gallons. Automated monitoring and control are the keys to maintaining cooling system efficiency. By accurately transmitting information to the valves that control the amount of blow down (water drained from the cooling tower reservoir) and subsequent makeup water, a conductivity controller can dramatically reduce operating expenses. Installing a state-of-the-art integrated pH Conductivity Controller will allow you to upgrade your cooling tower water treatment by adding chemicals that control the pH in the system. This may help prevent scaling in your cooling tower, even as you increase its water efficiency. In order to qualify for rebates, a pH controller must also measure conductivity. Upon installation of a qualified device, you will save significant water in the operation of your cooling towers, improve operational efficiency, and reduce sewage and chemical costs. Contact your local HVAC contractor for information on how to purchase rebate-eligible controllers.